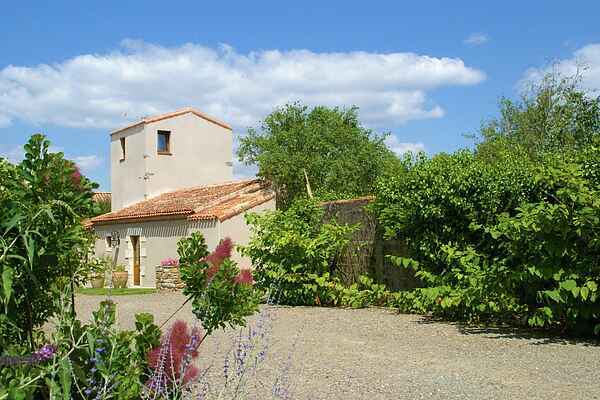 This modern house is on a quiet estate 500m from the ocean and 9km from Sables d'Olonnes! The house has a modern and warm interior. Enjoy your own enclosed garden with terrace and barbecue. It's lovely in the daytime to read a good book, or in the evening for a friendly barbecue! Also special, the tower where you have a fine view of the sea. You have at your disposal 4 bikes (2 ladie's/2 men's). Perfect to start exploring the region! Days on wonderful beaches await; fine sandy beaches at the lively seaside resort of Sables d'Olonnes (9km). This town has even more to offer, also honour the splendid zoo (you see the pink flamingoes already from the road!) with a visit. And go on a boat trip through the heart of the salt marshes; also called the road of the salt mines. Admire the medieval castles at Talmont-Saint-Hilaire (12km) or at Commequiers (25km). In Talmont Castle, where the king of England Richard the Lionheart once lived, there are beautiful light and image shows during the summer months.